This article emphasizes the value of a therapeutic presence in terminal death situations. An unusual clinical case illustrates the point. The presenting issue was aggression between an adult son and father. It soon became apparent, however, that this son was profoundly enmeshed with his mother. During the course of family therapy the father died, and then the mother was diagnosed with cancer. The therapist changed therapeutic goals and attended to the relationship between mother and son. He made home visits to the mother and the surviving son. She seemed to die peacefully and the son moved on with his life, which prior to the death of his mother would not have appeared likely because of his profound dependence on her. Resolving pathological attachment is not easy. Attachment theory refers to the affectional bonds or attachments, initially between child and parent and later between adult and adult. It is suggested that terminal illness and death can, with help of a therapist, alter this attachment bond, even though the literature on adult dependency and attachment does not refer to death in this manner. The professional literature on terminal illness is abundant. It reveals concern about making the end of life as easy as possible and addresses the range and intensity of feelings that can emerge in both patient and caregivers. But most of the discussions are about palliative care or pastoral or spiritual assistance, providing some form of antidepressant medication for the dying person or working with the suicidal elderly, rather than providing some clinical or psychotherapeutic response. If the dying person is in hospice care, an attentive volunteer can provide a kind of therapeutic interaction, but hospice and nursing tend not to emphasize what would traditionally be called therapy. The attitude seems to be that therapy with a dying person is not worth the effort, since this person will soon be gone and it is not worth the bother trying to resolve issues at this stage of life. This attitude, however, is countered by those who clearly affirm that therapy with the terminally ill can be a rewarding and powerful growth experience, where the presence of the therapist provides an essential support for those facing the last task of life, dying. Even family therapists, although ever breaking new ground, rarely discuss the role of death in families. They more commonly attend to managing symbiosis, enmeshment, fusion, and overinvolvement. With rare exceptions, books on family therapy do not contain references to death or terminal illnesses. Certainly, there is an abundance of literature on various kinds of losses, such as divorce, death of a loved one, dismissal from a job, with the bulk of the literature on helping people manage grief and the sense of loss. This paper suggests, however, that therapeutic care of a dying parent can appropriately attend to issues of pathological attachment, not only on the part of the parent but also on the part of the adult child left behind. Obviously, there are those for whom death is not a resolving force, but this case study is offered with the suggestion that a pathological attachment on the part of son and mother was resolved during the period of her terminal illness. The therapist understood the situation in light of John Bowlby's articulation of the attachment or dependency bond between parent and child, compulsive caregiving, and overdependence. Treatment was informed by concepts drawn both from object relations and family therapy. In this case, multiple issues were present, but the focus is on the pathological attachment, mostly on the part of the mother, which was attended to in therapy. This mother had only minimal insight into the strength and compulsivity of the bonds that tied her to her son, particularly by behavior termed "compulsive caregiving," by Bowlby. The original presenting issue was neither illness nor a clear indication that the issues involved the son and a profoundly dependent mutual attachment. The 64-year-old mother made the initial contact with the therapist, referred by her minister. Arriving for the first visit alone, she raised rather vague concerns about violence and fighting between her husband and adult son who lived with them. The therapist requested that all three members of the family come for the second session. Because the mother was the only one in the family licensed to drive and had a lot of executive authority in the family, she agreed and, indeed, for the second session she arrived with the 71-year-old father and their 26-year-old son. The father was retired and spent much time with his stamp collection; the mother worked part-time as an office worker, and the son had within the past year become fully employed and was doing an inordinate amount of overtime (as much as 30 extra hours per week). The family was socially engaging, but did a lot of bickering during the initial session and found it hard to be explicit about what--if anything--they wanted to change in the family. The father and son were accustomed to watch sports on television and the mother's references to violence had to do with father-son arguments about sports statistics and whether to video-record particular games, etc. It emerged in later sessions that there was indeed violence in the family in the form of the son punching the wall, breaking things in the house, and hitting his mother--especially when he felt she was too suffocating although he never explicitly articulated this feeling. There also emerged slowly and under questioning the powerful bond between mother and son. She used to help him wash his hair, run his bath, buy his clothes, buy candy for him, drive him to work and the movies, fix his meals, make his bed, straighten his room, and even check on him at night to see if everything was alright. The therapist made considerable use of consultants, most of whom concurred with his tentative diagnoses (pathological attachment but listed as a NOS Disorder of Adolescence, 313.9) and treatment plan. The therapist sought to assist members of this family to become alert to their connectedness and how that would be affected in times of stress, loss, and death, and to gain skills that would enable each of them to move on to the next stages of their lives. The son, however, did not indicate an interest in leaving the home, did not verbally indicate he felt smothered, but some of his actions--such as his occasional hitting of his mother and breaking of household objects or punching the walls--were expressions of resentment of her intrusions, although his verbal statements were not at all clear about this. (About eight years previous, he had dropped out of college and had some brief therapy to deal with agoraphobia.) He dressed reasonably well but was toothless at age 26 and resisted his mother's wishes that he see a dentist for false teeth. He was friendly with a woman his own age, and he mentioned one other distant male friend but he never discussed any romantic interest or other relationships. As sessions continued, the mother began to express some of what she hoped would change. She did not care for the way her son had mounds of newspapers and books piled in the living room and on the living-room table. He had a collection of the past six or seven years of one local alternative newspaper stashed in a corner. If she surreptitiously tried to throw some of these papers away, he seemed invariably to know and would get angry at her. It also turned out that she too had her piles (usually of magazines and "important papers") in the living room but these piles were substantially smaller than those of her son. The therapist speculated over the symbolic and real meanings of this kind of hoarding and saving, wondering whether it represented the need for emotional supplies, or fears of deprivation and nonavailability. As the therapist was trying to make sense of this and other florid symptoms (the mother indicated her son's room was a mess, that there was a lot of clothes lying on the floor of his room; that the father's study was crammed with his stamp collection and sports memorabilia, that the dining-room table overflowed with "stuff," that there were holes in the wall that the son had punched in moments of great anger) he thought it would be helpful to verify some of the accusations and descriptions by arranging a home visit. Accordingly he requested and received permission to have a home session. 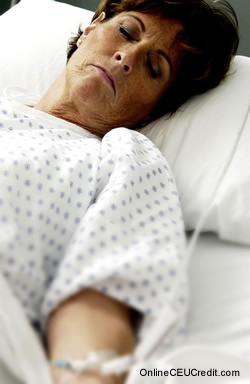 The precedent for a home visit was useful later during the mother's terminal illness. The inside of their middle-class home was worse than the therapist had imagined. The son's room was really terribly messy with clothes and discarded articles of various kinds strewn about the room. Two or three rooms had noticeable unrepaired holes. Within a fairly short span of time and before any therapeutic progress was made, the father became ill and soon died. The therapist expected some obvious change in the family dynamics; the therapist speculated the father was a triangle figure within the family. Because the father, however, had not been psychologically effective in the family and because the family was so rigid, there was no noticeable change. The son did not even take on any of the routine household chores that his father had performed. The mother resisted efforts to become aware of her actions that enabled the son's odd behaviors and resistance to assuming adult behaviors and adult responsibilities. The therapist did report the son to the office of elder affairs for elder abuse, but the mother told the therapist that she merely had a "nice chat" by phone with an investigating social worker whom she assured that everything was "fine." The son did not perform even minimal tasks around house. He never learned to drive. In short, his behavior did not change and he began missing sessions as the therapist tried to foster a sense of separateness by raising issues of his future and the inevitable aging and decline of his mother. The mother developed cancer. Over the last six months of her life, the therapist conducted several home sessions as she was no longer able to drive. The therapist was of obvious help to the mother in the final weeks of her illness. Of special focus was her concern for her son and his future. She was a religious woman and did have church contacts who also visited her. The son participated marginally in these home sessions and seemed to be alert to the issues, but he never overtly made active use of the therapist nor sought assistance. He resisted all efforts to become overtly more independent, such as learning to ride a bike to work rather than depend on his mother to drive him or learn skills that he would need, such as cleaning and cooking. No change occurred, but violence declined. The therapist had conversations with the son about his need to make independent steps if his mother were not alive. The term "conversations" is used because the therapist did not have any indication how vital these issues were felt to be by the son. The son did indicate mild concern over the mother's imminent death but did not seem unduly anxious. He never really established a good working alliance with the therapist, although he did manifest that he had learned over the course of therapy to show occasionally more verbal respect to his mother and on rare occasions even respectful behavior. When the mother died, the therapist attended her funeral. The son acted appropriately and greeted those who were present at the funeral in an acceptable manner. He welcomed the therapist cordially, thanked him for his help, and then passed on to the next mourner. The son never contacted the therapist after the funeral but he received independent information that indicated that the son was surviving and thriving, supporting himself and maintaining himself in the world. Resolving or modifying pathological attachment is not easy and often not possible. Terminal illness and death, however, would appear to be the ultimate way to resolve this attachment bond, even though the literature on adult dependency and attachment ordinarily tends not to focus on death's role in altering pathological attachment. Attachment theory, based on the work of John Bowlby and later Mary D. Ainsworth et al., considers "affectional bonds or attachments, initially between child and parent and later between adult and adult. The forms of behavior and the bonds to which they lead are present and active throughout the life cycle ...". These emotional bonds, especially between parent and child, are strong and part of human survival skills. Bowlby's work, while attending to the attachment bonds through separation and loss, does not consider the positive role that terminal illness might have on working through the pathological dependency. This case, however, confirms that therapeutic assistance made the mother's last years much better than they might have been. The therapist was of assistance to her as she lost her husband, an experience of loss in which her son offered no support. During the course of her terminal illness the therapist helped her in letting go of life without undue anxiety about leaving a son to whom she was profoundly attached. In seeking a therapeutic relationship, neither the mother nor the therapist could have known that family therapy would eventually turn into therapy with the terminally ill. As Richman has rightly pointed out, treating the elderly can indeed sometimes turn out to be treatment that involves terminal illness, and treatment of the terminally ill can be a rewarding, even profound, experience for both therapist and patient. Such was especially true in this situation. The preceding section contained information regarding terminal illness and the altering of the attachment bond. Write three case study examples regarding how you might use the content of this section in your practice. According to St. Clair, what is the ultimate way to resolve pathological attachment? Record the letter of the correct answer the CEU Answer Booklet.